Arizona State has already begun spring practice. Washington won't take the field until April. As each team prepares for spring football, Pac-12 Hotline's Jon Wilner fills you in on what you need to know. This time last year, the South division was loaded with intrigue driven by fresh faces, be it the new head coaches at Arizona, Arizona State and UCLA or the freshman quarterback at USC. There’s no shortage of intrigue this winter, either, but now it’s about several of those fresh faces reversing negative narratives. Meanwhile, no head coaching changes and only one major move at the coordinator level — the departure of Oregon defensive playcaller Jim Leavitt — would seem to indicate stability in the conference’s dominant division. That’s not entirely the case, however. Four teams have varying degrees of uncertainty at quarterback, either because the returning starter was underwhelming in 2018 (Oregon State and Cal) or because there is no returning starter and the presumed replacements haven’t taken a snap competitively for their team (Washington and Washington State). The Hotline made every effort to avoid a quarterback overload in the team-by-team assessments below. But it’s difficult … very, very difficult. We begin with Arizona State, which is already under way, and continue in chronological order. What to watch: Three freshmen quarterbacks, one junior quarterback, and a huge void to fill following Manny Wilkins’ departure. Daniels was the top-ranked quarterback in California in the class of ’19 and will be given every opportunity to win the job. 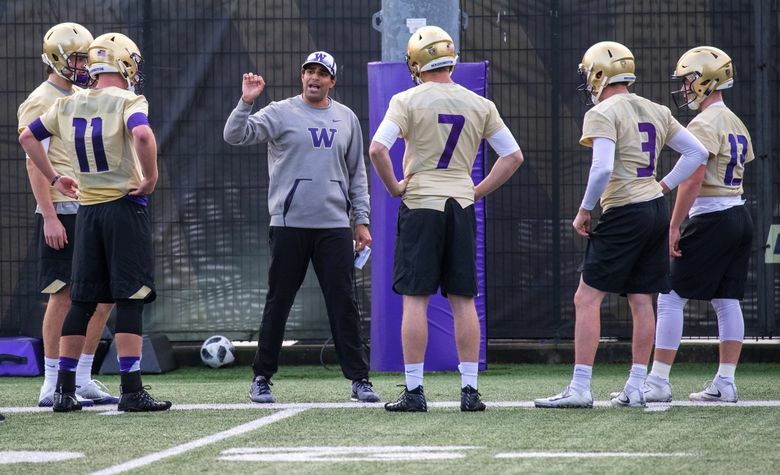 There seems to be less-than-zero chance of coach Herm Edwards and offensive coordinator Rob Likens naming a starter at the close of camp, but we should have a decent feel for which of the four quarterbacks won’t have a chance to start in September. It’s not all about the rookies; don’t discount veteran Dillon Sterling-Cole. What to watch: The unwatchable, also known as Cal’s offense. There are several issues to resolve in order for the Bears to be merely adequate. Will Modster, from Westwood by way of Palomar College, beat out incumbent Chase Garbers, who hardly locked down the starting job with his uneven play? Who will replace Patrick Laird, who rushed for 961 yards. And what of the downfield passing game? The Bears averaged a measly 5.7 yards per attempt, lacked big-play speed and must replace their top-two wideouts. Oh, and the offensive line must replace two key starters. Coach Justin Wilcox retained his assistants but shuffled assignments, in case you were wondering. What to watch: Sure, the Cardinal needs big-plays replacements for tailback Bryce Love and receiver JJ Arcega-Whiteside. But the opportunities will be limited for receivers and running backs if Stanford doesn’t upgrade an offensive line that underachieved last fall. That process must start in earnest this spring due to the grueling early-season schedule (Northwestern, USC, UCF and Oregon in the first month). Guard Foster Sarell and tackle Walker Little are elite talents, and they aren’t alone in that regard. If the unit doesn’t make a jump in cohesion in the second year under Kevin Carberry, something’s amiss. What to watch: Yes, we’re curious about Ludwig’s approach but assuming there won’t be radical changes to the scheme his predecessor, Troy Taylor put in place. Instead, the Hotline plans to keep a close eye on the middle of the defense following the departures of linebackers Chase Hansen and Cody Barton and safeties Marquise Blair and Corrion Ballard. The most intriguing player in that regard is linebacker Francis Bernard, the BYU transfer, who takes a larger role for the Utes in 2019. The perimeter should be first rate. If the interior is merely solid, Utah will again have one of the best defenses in the conference. What to watch: Here’s a better question: What doesn’t need to be watched? Well, the Beavers are set at tailback with Jermar Jefferson, and the receivers (Trevon Bradford and Isaiah Hodgins) are more than acceptable. Otherwise, there are issues, holes, questions and concerns everywhere for second-year coach Jonathan Smith. Emerging from spring with a No. 1 quarterback would help matters, but that depends on Jake Luton’s health and Gebbia’s comfort with the offense. He was a highly-rated prospect in high school (Calabasas) who left Lincoln last summer after losing the QB competition. What to watch: Sophomore quarterback Dorian Thompson-Robinson’s development is vital to a turnaround, but several other areas that demand attention, too. Topping the list, in the Hotline’s opinion, are the defensive edges. UCLA was 119th in the country in sacks per game last season (1.25) and 117th in tackles-for-loss (4.58). The pressure must improve. The Bruins have several solid pieces, including Keisean Lucier-South, but no obvious replacement for the dynamic Jaelan Phillips, who left the program. What to watch: The Hotline is of the opinion that the Trojans should recreate their Student Body Right/Left dominance at the line of scrimmage and bludgeon all foes. Of course, that would take a different head coach, a new mindset and revamped recruiting/teaching of offensive linemen. Given the realities of the program in 2019, anything Harrell can do to spread the field and add creativity to the passing game — screen passes! — will upgrade the offense. It’s Pro Style (traditional USC) vs. Conference USA (Helton’s background) vs. hybrid Air Raid (Harrell). What to watch: The easy answer would be the receivers, where the Ducks must not only replace Dillon Mitchell but find dependable second and third options for quarterback Justin Herbert. Or you could argue the focus should be on Keith Heyward, who (presumably) takes charge of the defense following Jim Leavitt’s departure. But the Hotline is curious about a larger issue in Eugene this spring: What do the Ducks want to accomplish on offense? What’s their mentality? And are the players fully bought in? Watching them last year, it was difficult to spot an identity (run or pass, power or finesse, tempo or grind,). Perhaps this spring will bring clarity. What to watch: We could focus on Khalil Tate’s body language and interactions with play-caller Noel Mazzone and coach Kevin Sumlin and leave it at that. But we won’t, because Tate needs someone to throw to. More than one someone, in fact, and the Wildcats lost their top-three receivers (Shawn Poindexter, Shun Brown and Tony Ellison combined for 23 of 29 touchdown receptions). Who emerges this spring? All eyes will be on Curry, the Wildcats’ only 4-star recruit. But the role players from ’18 must develop. What to watch: Obvious answer: Laviska Shenault’s toe. More nuanced answer: CU’s mindset. The Hotline chatted with Mel Tucker at the national championship game, and it’s clear that he plans to deploy a physical approach at the at the line of scrimmage, one shaped not only by his time in the SEC (Alabama and Georgia) but also the AFC North. (He was on the Browns’ staff when did did not stink.) Going old school in a division with several finesse teams makes sense for the Buffaloes. Adding Johnson is a good start toward that end. What to watch: The competition at quarterback … and everywhere. Recall what Mike Leach said midway through last season when asked to explain WSU’s unexpected success: “I’m not sure that part of it didn’t have to do with the fact that we had so many open jobs and so many people competing for jobs. You had to fight to get reps.” The Cougars have a load of returning starters, particularly on offense, and plenty of veteran second-stringers — all of which is better than having inexperience across all units. But how will Leach recreate the sense of urgency that fueled the ’18 run when he has so many incumbents? What to watch: Jacob Eason, Jacob Eason and, well … He’s not an addition to the program so much as to the active roster, having sat out last year following the transfer. Eason steps into a situation primed for success, with a veteran line, experienced receivers and nice pieces in the backfield. But he hasn’t played competitively since early in the 2017 season, which came after he lost his job to a freshman (Jake Fromm), which came after a knee injury. In other words, there are questions as 2019 approaches: What’s the rust level? What the comfort level with the playbook? How’s the dynamic with OC Bush Hamdan? Drawing conclusions from intra-squad scrimmages could be tricky due to the significant number of first-time starters on defense.